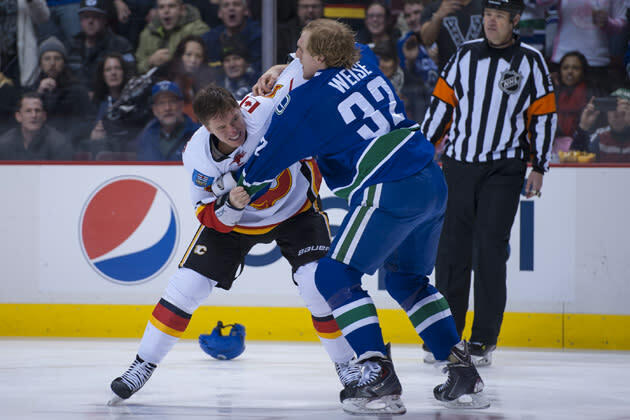 The opening face-off for the Vancouver Canucks' Saturday night tilt with the Calgary Flames featured Kevin Bieksa taking the draw against Kevin Westgarth. That should serve to underscore how little either team cared about winning the draw, or playing actual hockey immediately after it. Instead, with both fourth lines on the ice, the puck drop was followed by the immediate dropping of gloves. 20 gloves, as every skater squared off with another. Five simultaneous fights. No goalies? Granted, Roberto Luongo has made his stance on fighting quite clear, but this could have been something truly special. Actually, it was still pretty special. And also pretty shameful. It was Hockey Day in Canada, you guys. This day is to celebrate hockey, not, I dunno, whatever this was. Suffice to say, there were a boatload of misconducts and ejections. When the smoke cleared, as well as all the equipment and the blood, 142 minutes of penalties had been handed out in two seconds of game play. Among those ejected: poor, poor Kellain Lain, who was making his NHL debut in front of his family, who had flown out from Ontario. You'll note that John Tortorella is furious in this clip, presumably at Flames coach Bob Hartley's choice to ice his fourth line to start this game. It wouldn't be the first time. In March of 2012, when Tortorella was coaching the New York Rangers, he countered Peter DeBoer's decision to open the game with three New Jersey Devils tough guys by sending out two tough forwards and defenceman. In that instance, as in this one, a line brawl ensued. But Tortorella's anger didn't stop there. At the first intermission, he charged down his own team's hallway, into the main hallway, and up into the Flames hallway to get at Calgary's coaching staff. As you can see, he did not succeed, but good lord. One assumes there will be repercussions from all this. In the meantime, if you had January 18th on the "John Tortorella flips out" pool, congratulations to you and yours. "I see the starting lineup and I know the guy across the bench. I can't put our players at risk that way. I'm not proud of it. I've apologized to the players involved. My biggest mistake was putting Lain in the starting lineup. I thought my players responded tremendously. I don't want that in the game, but I have to protect my players too."